Thanks to those recommendations, Solution Architects responsible for architecture of final solution can feel safe – you know … ‘it has been recommended by Sitecore’. And now … you are Solution Architect and you customer cannot use cloud solution … what to do, where to start? The most obvious answer which comes in such case to the head is : “check documentation”. I did that and below I will share what I found and what can be useful – maybe it will save your time and for sure will let me to remember what I found. In few places I assumed that we can try to use Sitecore’s Azure recommendations to calculate hardware requirements for VMs/Dedicated Servers. The recommended hardware requirements are for running the software on a single computer. For more information about running Sitecore on different kinds of hardware, consult your Sitecore partner or technical sales representative. In case when you are working on the architecture for new Sitecore’s customer (or you are in the up-selling process) you can/should contact Sitecore Account Manager to get some help from their side – but remember – do not expect that someone will do your job. If you plan to use one or more processing, dedicated publishing, and/or indexing servers that do not handle requests, you must use Application Initialization (https://docs.microsoft.com/en-us/iis/configuration/system.webServer/applicationInitialization/) to successfully start Sitecore after you recycle the application pool. If you do not do this, Sitecore will not launch and its application pool can shut down due to inactivity. 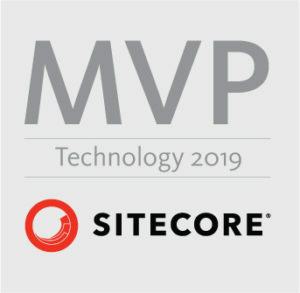 Sitecore XP 9.1.0 does not support the MMAPv1 storage engine because it does not support retryable writes. = replication for Mongo is not available. Alright, you know already what I found. I hope you found something interesting for you. The question is – how to build architecture based on data from previous paragraphs? That is hard – you probably still may have a feeling that we do not know enough to do that. 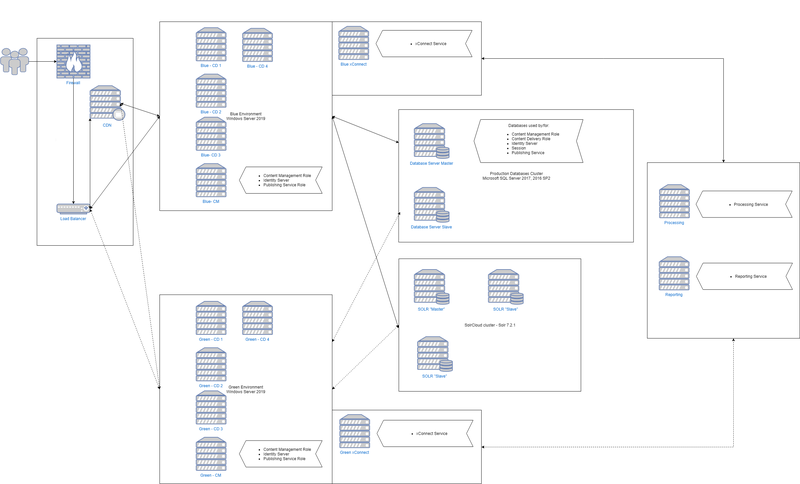 The first thing which I had checked before I started diagram with the servers was the diagram of database connections to check relations. Result of that check is available in my previous blog post: “All (almost) connections to databases in Sitecore 9.1“. When you unzip the packages you will find the smaller packages with configuration for all available nodes in the downloaded file. After all that I was able to draw the diagrams which I also share with you – as maybe they will help someone. WARNING: I am sharing that as an example – your final architecture can be different because of the different requirements of your customer – do not treat those diagrams as ‘the one and only correct’ architecture. Basically that is all what I wanted to write today. If you would like to add something – please use comments section or find me on slack/twitter. If you seek for tool to build own diagrams similar to those prepared by me – I recommend to check ‘draw.io’ tool available via Google Drive. That will be a really quick and short blog post. 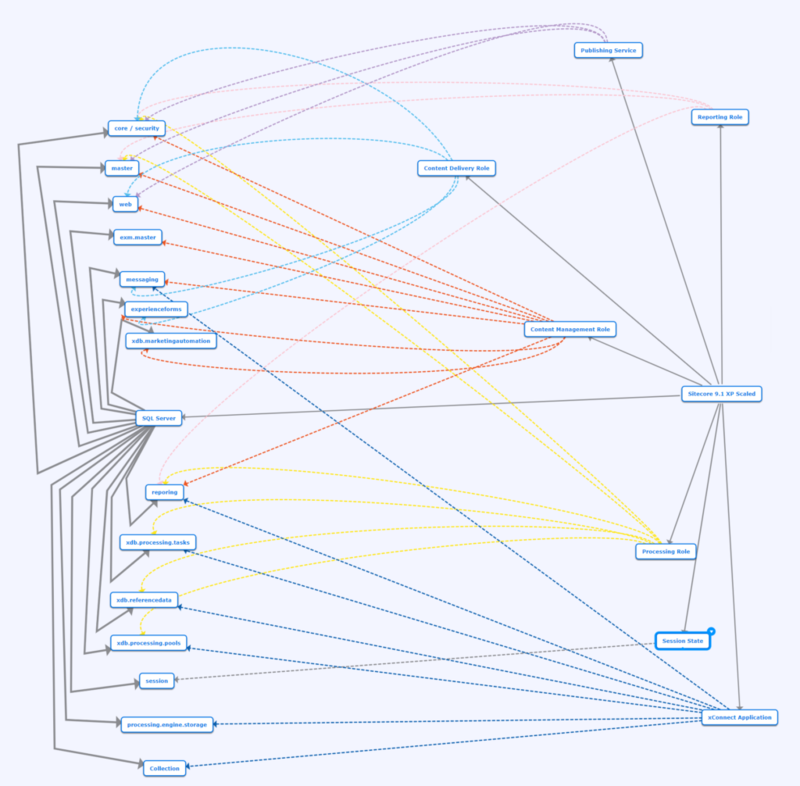 I would like to share with you a graph which I made when I was checking which services/roles connect to SQL Server and which databases are utilized by particular items. Click the image if you want to open it in an original/bigger size. I hope that it will be helpful for you because I believe that one image is worth thousands of words. I noticed that accidentally that by default CM application uses http not https – at least when we use installation scripts for on-premise XP0 topology. Because I wanted to add https to my website I asked myself – “how can I do that EASILY?” I do not know how about you – but I hate to play with certificates on my local machine – very often it means many lost hours which I could spend on development of new features. Invoke-AddWebFeatureSSLTask -Hostname sc910.sc -SiteName sc910.sc -Port 443 -ClientCertLocation LocalMachine -OutputDirectory "C:\certificates" -RootDnsName "DO_NOT_TRUST_SitecoreRootCert" -RootCertName "root-authority"
HostName and SiteName should be values used by your website (check it in IIS configuration if you are not sure). Output directory is a place where you store your certificates. The rest of the parameters I would leave unchanged because they use default values from Sitecore’s installation scripts. Because Identity Server uses http by default – please remember to update its configuration. If you do not do that – you will not be able to log in into Sitecore instance. More details about that you will find here. Author Łukasz SkowrońskiPosted on 09/01/2019 09/01/2019 Categories PowerShell, Sitecore 9.11 Comment on How to add https/ssl support to Sitecore 9.1 local instance? I do not know if you are so lucky as I am … but every time when I am trying to install a new version of vanilla Sitecore on my local instance I have got issues which did not appear for other developers. I spent few hours trying to fix that. Based on previous experiences with Sitecore 9 and issues which I had with certificates I checked if my xConnect is accessible from the browser – it wasn’t. So I knew why I saw that error. 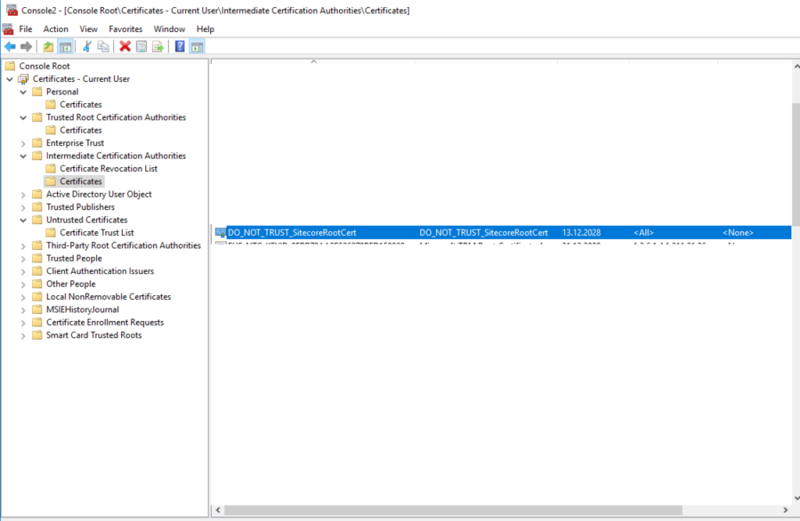 Usually, when I had an issue with certificates I had to just add those certificates to the trusted list with mmc tool (more details here) but not this time. The third link has been mentioned in the second link as a solution. In my case, this didn’t help but suggested the solution. Powershell scripts were moving certificates to Intermediate Certification Authorities category – in theory it should be enough … in my case didn’t change anything so I checked what I had in this directory. I found out that DO_NOT_TRUST_SitecoreRootCert was added there many times. That was signal to me that it seems to be an issue. I deleted all of them before I tried install Sitecore again. And it worked! Currently, after installation I have got just one SitecoreRootCert.